With millions of original Swingball sold worldwide, Pro Swingball takes this addictive racket game to new levels. Standing 1.75m tall with thicker tubing and an extra large base for greater stability, Pro Swingball is the perfect match for adults and older energetic kids. It’s so tall that players sometimes have to jump off the ground to reach the highest shots! Using a longer spiral, the game play remains the same as the original. Start at the middle and players take turns hitting the tethered ball in opposite directions – the first one to the top or bottom is the winner! The portability of Pro Swingball means you can take it to the beach, park or almost any outdoor event and challenge all your friends or family to this great outdoor game. With several different products in the Swingball family, anyone can enjoy the fast and vigorous action offered to almost all ages. Younger children of 3 and over will enjoy playing with the First Swingball set, whilst intermediate players have a choice of Turbo Swingball or All Surface Swingball. 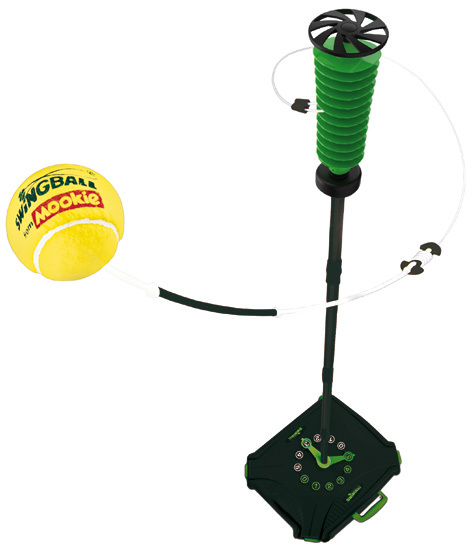 Please tell us what you think of Pro Swingball by Mookie.